This weekend in Rome, the Catholic Church is set to begin a wide-ranging synod (assembly) on family issues. The two-week meeting comes at a time when most American Catholics say they disagree with their church’s teachings on family-related issues such as birth control and divorce. It also takes place in the wake of recent actions by Pope Francis that hint at the possibility of changing attitudes within the Vatican on questions related to marriage and family. Last month, Francis fueled speculation about potential changes to church policies toward marriage by performing 20 weddings, including for couples that had children out of wedlock, had lived together before marriage or had been previously married. A Pew Research Center survey conducted in 2012 found that relatively few U.S. Catholics (19%) said that getting a divorce is morally wrong. 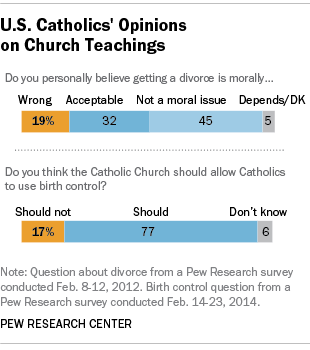 About a third (32%) said divorce is morally acceptable, while 45% said it is not a moral issue. There were not significant differences on this question between Catholics who attend church weekly and those who attend less often. The church’s teaching on marriage is more nuanced than simply prohibiting divorce. It does, for example, allow some couples the option to annul their marriages. Annulments do not sever a marriage but instead declare that the marriage was never valid because it “fell short of at least one of the essential elements required for a binding union,” according to the U.S. Conference of Catholic Bishops. The church holds that divorced and remarried Catholics must have obtained an annulment before they can receive sacraments such as communion or confession. Francis recently appointed a panel aimed at streamlining the annulment process, although it has drawn opposition from some cardinals. Another area in which American Catholics see things differently than the church is its teaching that “artificial contraception is contrary to God’s will for marriage because it separates the act of conception from sexual union.” As an alternative, the church promotes “natural family planning” (based on tracking a woman’s menstrual cycle) as an option for married couples. Most American Catholics do not object to the use of artificial birth control on moral grounds. In a survey we conducted earlier this year, 77% of U.S. Catholics said the church should sanction the use of birth control – and 56% think this change will definitely or probably happen by 2050.